Prepare with our CPIM Study Guide and Practice Questions. Print or eBook. Guaranteed to raise your score. Get started today! 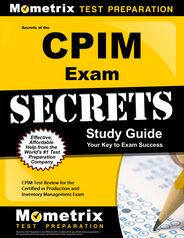 The CPIM Strategic Management of Resources Exam is the fifth and final exam of the exams created by the Association for Operations Management, also known as APICS, that are administered by Promissor and are required in order for an individual to receive a Certification in Production and Inventory Management. This certification can be extremely useful as a resume-builder for individuals in the manufacturing and warehousing industries, but in order to receive the certification, the individual must pass all five CPIM exams. 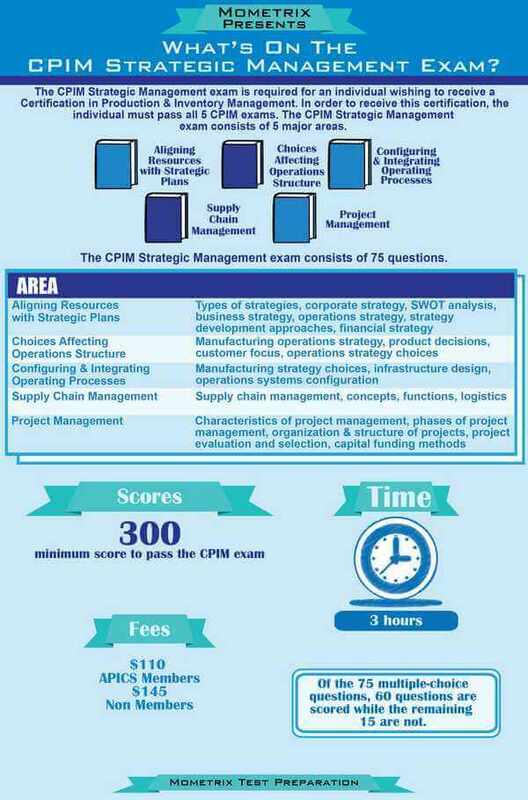 This exam consists of 75 questions, 60 of which are scored and 15 that are not scored, related to concerns involving competitive markets, allocation of resources based on the strategic plan, implementation of operating processes in order to achieve the strategic plan, and change implementation strategies. CPIM Flashcards. 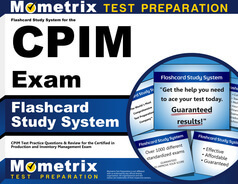 Proven CPIM test flashcards raise your score on the CPIM test. Guaranteed. There are also questions related to decision-making strategies specifically regarding facilities, the supply chain, information technology, and organizational design. The exam-taker has three hours to complete the exam and there are no official breaks scheduled during that period. The exam is scored based on a scale of 265 to 330 with 300 as the minimum score necessary to pass the exam. To register for the exam, you must contact APICS to get a customer number and register online or by phone with APICS or Promissor to schedule a testing date. The registration fee for the exam is $110 for APICS members and $145.00 for nonmembers. 1. A: The correct answer is “a.” The companies that produce goods to meet demand are said to be marketplace driven. The demand in the marketplace is determined through market research, which includes market analysis, sales analysis, and consumer research. Such research can be conducted by the company itself, its designee, or by independently contracted parties. Market-driven means that research determines product demand and also defines how the product can be better made to obtain market share from competitors. 2. D: The correct answer is “d” because the question is addressed toward business strategy. A successful business strategy is one that supersedes current offerings for product development, manufacture, and consumer sales. In order for a product to succeed, the business strategist seeks advantage in price leadership, product differentiation, and a focus upon the customer. Low product prices, unique or improved products, and responsive customer service are essential to a successful business strategy. 3. C: The best answer is “c.” To correctly answer the question, it helps to know the difference between the terms order qualifier and order winner. The so-called smart phone provides a handy example that demonstrates the meaning of both terms. Several manufacturers make smart phones that meet consumer needs, requirements, and demand, yet the popularity of Apple smart-phones borders on obsession. The ability of several manufacturers to product excellent smart phones means that their products are order qualifiers. The ability of Apple to continuously increase their smart phone market share over competitors means it is both order qualifier and order winner. 4. A: The best answer is “a,” considering that the question asks you to choose the statement that explains how a company (rather than the product) is the basic reason it becomes an order winner. Several companies make reliable cars, according to vehicle rating agencies like J. D. Power et al., but a long recognition of superior quality and customer service may drive a company (like Toyota) to acquire market share beyond the qualities of its products. Consider that auto sales records show that Toyota is an order winner in spite of recent well-publicized events. Another example of a company-driven order winner is Ford, not only because it produces order qualifiers, but because the consumer has certain perceptions of the brand and because the ratings agencies (Consumer Reports and J. D. Powers, for example) have characterized the company in a positive way. 5. C: The correct answer is “c.” Like price, quality is often an order qualifier rather than an order winner. Customers cannot always differentiate the quality levels of their competing suppliers. An important distinction to make in considering product quality is the difference between actual quality and perceived quality. Customers may perceive products with packaging that looks cheap or other superficial tags as being poor quality, even though they meet all stated specifications. Both actual and perceived quality must be at acceptable levels for success of the product in the marketplace.